If you have experienced frequent dropped calls, poor cell signal quality, or low internet speeds within your commercial building, you can probably assume there’s a problem with your cell signal. It could be that the surrounding landscape or other buildings are blocking the signal from a nearby cell tower. It’s also possible that the signal from the closest cell tower is too faint for your phone to pick up. Even your building materials themselves might be the problem, blocking an otherwise strong signal from reaching your devices. Any of these factors could indicate the need for a commercial cell signal booster installation. Once you’ve decided to explore a professional cell signal booster system as a solution, the next step is to educate yourself about the process so you know what to expect. A professional dealer or installation expert will be happy to meet with you, assess your building, and propose a system design that fits your particular space and signal amplification needs. 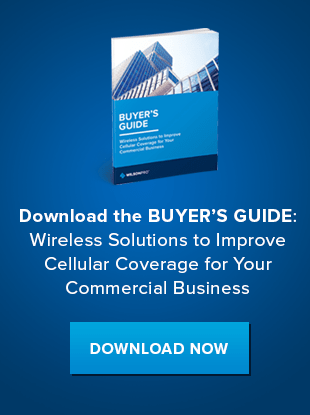 Here, we’ve outlined what to expect regarding commercial cell signal booster installation. The first step in the process of installing a cell signal booster system should always be a site signal survey. If possible, communicate with an experienced dealer beforehand and send along your building’s floor plan to give an idea of what the installer should expect before even setting foot on your property. Learn more about a site survey and signal booster options. The site survey is an opportunity for the installer to take signal strength readings from the rooftop and individual rooms of a building, usually with a signal meter. These professional readings indicate the strength of the outside signal, as well as the rooms with the strongest and weakest signals. The donor antenna (outside antenna), which is placed on the roof of the building. The signal booster (amplifier), which amplifies the signal. The broadcast antenna (inside antenna), which transmits the boosted signal to your device. The installer will note the best positions for all these components, and also make an estimate for how much cable and which accessories are needed for the system to work as a whole. Based on the site signal survey, the installer will recommend a rough design based on the building’s floor plan and the existing signal strength outside the building. Since commercial buildings vary greatly in size (from 20,000 square feet to more than 200,000 square feet, for example), it’s important for any cell signal booster design to be customized. For example, your building may require only one donor antenna but several broadcast antennas connected with cable splitters. The installer will then recommended a customized solution, describing the types of equipment needed, locations for installation, a plan for running cable, and notes on the final appearance and function. If the customer is satisfied with the plan, including the cost of materials and installation, the provider will work up a quote and begin to move forward with the installation. Once a final plan is agreed upon, the installation moves forward. There may be lead time depending on any products that need to be ordered and shipped, but the installation is usually straightforward and efficient. The success of the solutions is about correctly positioning each component and effectively connecting the outside antennas with the amplifiers and broadcast antennas. All equipment is FCC-approved, so commercial clients know the products are authorized for installation. WilsonPro cell signal boosters improve voice and data signals on all North American cell carrier networks and on all cellular-enabled devices, including phones, tablets and cell modems. WilsonPro installers proactively help with design needs to make sure the right products are installed in the right way for the best result. When you’re ready to implement commercial cell signal booster solutions, know that WilsonPro delivers top-quality service, expert guidance, and reliable system design to keep your commercial operation running smoothly for years to come. Contact WilsonPro to learn more about cell signal solutions for your commercial space.